William R. Carpentier, M.D., and John B. Charles, Ph.D. In September 2015, Bill Carpentier and I submitted this brief article to the NASA History Newsletter for consideration for inclusion in the 2015 year-end issue dedicated to Project Gemini. In January 1965, through a combination of preparation and luck, I (WRC) joined NASA‘s Manned Spacecraft Center, (now the Johnson Space Center) as a flight surgeon trainee and was privileged to participate in a truly great adventure. In July, I became a staff flight surgeon in the Medical Operations Office. I was soon assigned the job of flying in the recovery helicopter on Gemini 5, 6, 7 and 9 and working with the Navy Underwater Demolition Team (UDT) swimmers in order to provide medical support for astronaut rescue operations. This gave me a unique perspective on this ambitious manned program. Project Gemini was initiated in 1961 to bridge the knowledge gap between the successful but rudimentary one-man Project Mercury flights then under way and the ambitious three-man Apollo moon missions still a few years in the future. Gemini was intermediate in the number of astronauts it would carry, the durations of most of its flights, the altitudes of its orbits and the scope of its extravehicular activities. But there was nothing intermediate about its unprecedented challenge to its pilots. Gemini was intended to define the operational limits of astronauts in upcoming lunar missions including the most unique feature of spaceflight, weightlessness, for up to fourteen days—the duration of the longest foreseen lunar mission—compounded by extended confinement in a small cockpit inside a bulky, restricting space suit. The first two-hour orbital flight of Soviet cosmonaut Yuri Gagarin in April 1961, followed by six more flights lasting up to five days, did not revealed any unexpected life-threatening difficulties, but the Soviets did not disclose many medical details. American Mercury astronauts flew two suborbital and four orbital missions with excellent performance and no significant deleterious effects of weightlessness. 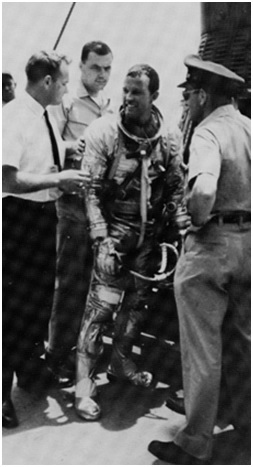 However, Gordon Cooper had a very high heart rate and was lightheaded when he stood up for the first time on the deck of the recovery ship after the final Mercury flight, the 22-orbit, 34-hour mission in May 1963. 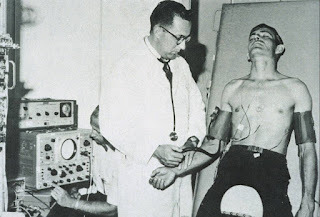 This “orthostatic intolerance” was not entirely unexpected because Walter Schirra had an increased heart rate and decreased systolic blood pressure when standing compared to lying down after his 6-orbit, 9-hour flight the previous October. Orthostatic intolerance means “intolerant of the upright posture while standing” and its symptoms include trembling, weakness, fatigue, poor concentration, lightheadedness, accelerated heart rate, and even fainting on standing because the cardiovascular system has trouble maintaining blood pressure and blood flow to the brain. These symptoms were believed to result from a decrease in blood volume during spaceflight, exacerbated by the fact that veins in the lower body may become more distensible post-flight, allowing more blood pooling in the legs. All Mercury astronauts had weight loss and increased heart rates, and five out of six had decreased systolic pressure after landing. 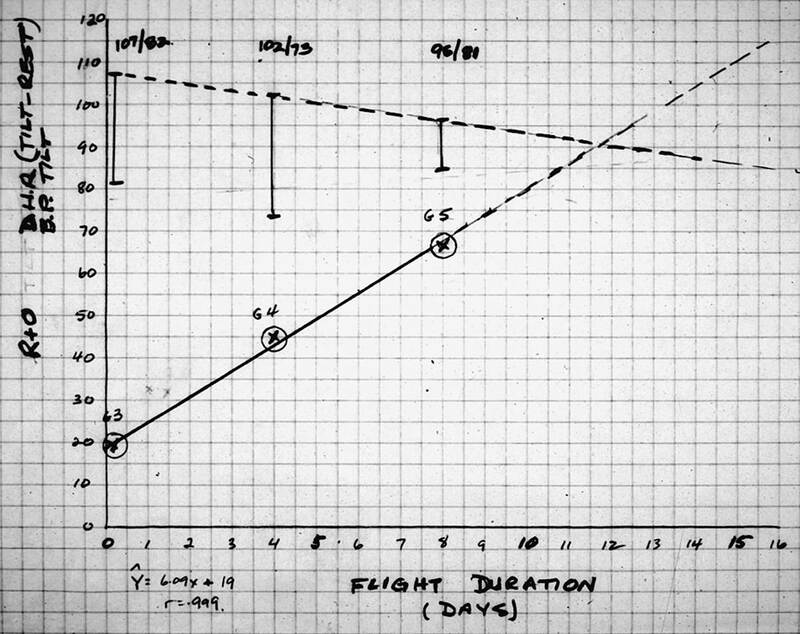 No one knew how much to be concerned about these findings, but they influenced planning for the upcoming Gemini flights, which were to gradually increase the time astronauts stayed in weightlessness: from just five hours on Gemini 3 (as short as the Mercury flights of John Glenn and Scott Carpenter), to four days on Gemini 4, eight days (matching early Apollo missions) on Gemini 5, and finally 14 days on Gemini 7. A defining feature of Gemini was its nearly-horizontal attitude during landing, as required for its initial plan for a land landing at an air base under pilot control instead of an undignified parachute splashdown in the ocean. The paraglider, an inflatable triangular wing developed by Francis Rogallo of NASA’s Langley Research Center, was to replace the parachute used by Mercury, and a successful—and safe—landing required the pilot to initiate a “flare” maneuver just before landing, bleeding off speed by slightly lifting the nose of the capsule. The Gemini capsule was to be tilted horizontally under the inflated Rogallo wing, permitting the astronauts to see the landing strip through their forward-facing windows. This meant that they were sitting upright under normal earth gravity, as in an aircraft, only a few minutes after leaving the weightlessness of orbital flight. Orthostatic intolerance may be merely annoying on the deck of a recovery ship, but if it occurred while landing the Gemini capsule, then it could result in a crash, astronaut injury or worse. Engineering problems eliminated the paraglider from the Gemini program in late 1964. 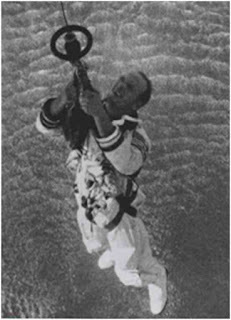 The Mercury-style parachute was restored, with the capsule still suspended horizontally under the parachute, but at a slight nose-up angle to permit it to splash down on the edge of its blunt heat shield instead of flat on its widest face, in order to slice into the water to minimize the shock of impact. 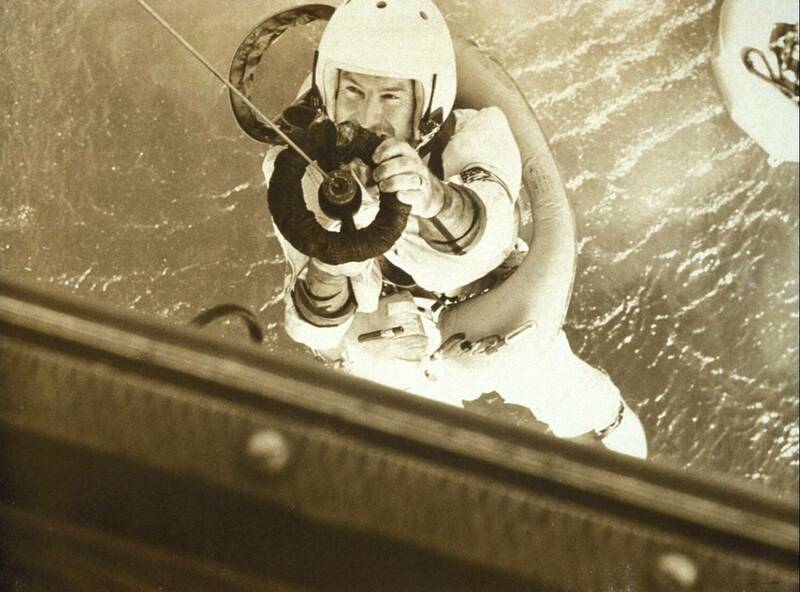 The critical piloting task was no longer a problem, but the astronauts would still be sitting nearly upright during parachute descent after two weeks of weightlessness, and then again while floating in the ocean for as long as it took to be rescued. 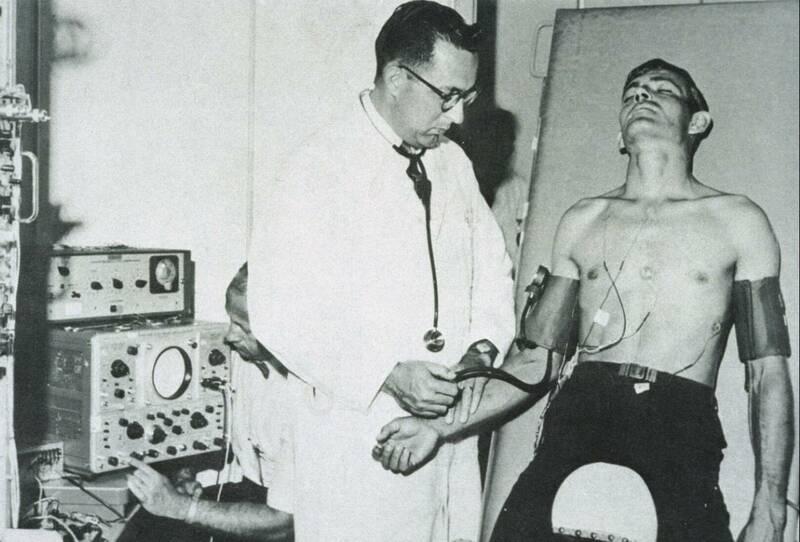 We routinely conducted pre- and post-flight tests on the astronauts during the Gemini program to measure their orthostatic intolerance by putting them on a “tilt table” that tipped them from horizontal to 70 degrees upright for 15 minutes while we recorded their heart rates and blood pressures every minute. This was among the earliest provocative testing done on astronauts returning from space, but not the first. In 1963, Gordon Cooper had 11 preflight tilt tests—including 5 prior to spacecraft checkout procedures and 6 following those procedures—and 4 post-flight tilt tests out to 19 hours after splashdown. NASA had assembled a large recovery team to go out on the aircraft carrier to pick up the Gemini astronauts. 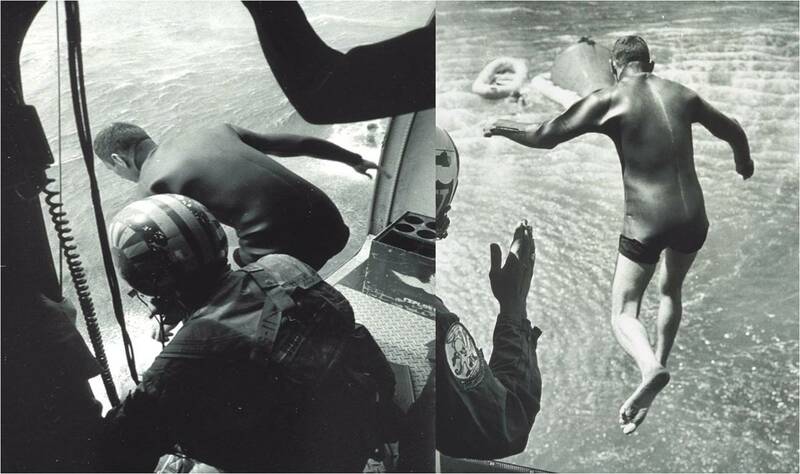 The recovery team included the Navy UDT swimmers, predecessors of today’s U.S. Navy Seals. 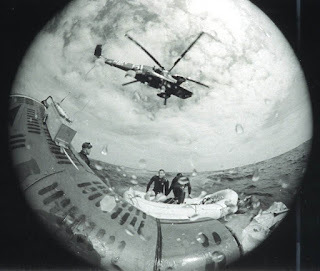 They jumped from the recovery helicopter to assist the crew out of the capsule and into a life raft, so they could be hoisted into the helicopter using a “horse collar” rescue sling. If the astronauts were injured or required medical attention, they would instead be hoisted horizontally in a Stokes Litter Basket up into the helicopter, to be attended by a recovery physician en route back to the carrier. A group of medical specialists were stationed on board the carrier to conduct the postflight medical evaluations. After Gemini 3 in March 1965, it was decided that, on future splashdowns, the physician in the helicopter should be able to jump with the frogmen in order to provide medical help immediately if required. However, the physician assigned to Gemini 4 indicated that he was not a very good swimmer and did not relish the idea of jumping into the ocean. The lead NASA recovery flight surgeon had to stay on the carrier. I, on the other hand, being a new, gung-ho flight surgeon with a background in competitive swimming and scuba diving, thought jumping out of helicopters with the UDT would be a great job. Even though it was likely I would never actually have to jump, I was required to have some practice training. A colleague in the medical office told me the frogmen went out of the helicopter 40 feet above the water at a speed of over 20 knots—something that definitely required being in good shape. I was able to do some training jumps from a U.S. Coast Guard helicopter into the Gulf of Mexico near NASA. The pilot wanted to try 20 feet and 10 knots, but I insisted on 40 feet and 20 knots (and then talked him into increasing the speed close to 40 knots). It gave me quite a jolt, but I kept telling myself I could do whatever the UDT divers did. 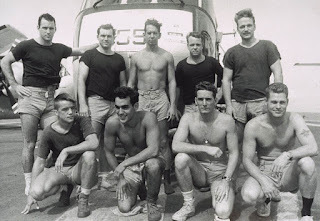 When I went out to the carrier for the Gemini 5recovery, I met the UDT team, men much larger than I and much younger than my 29 years. I was asked, “Have you ever jumped out of a helicopter?” When I responded, “Yes, I went out at 40 feet at 20 knots,” they were somewhat stunned: “You did what?” I learned that they usually went out much lower and slower. Back on the carrier after the recovery, our testing showed that the Gemini 5 crewmembers were both significantly affected by eight days in space. During tilting, their heart rates soared and their blood pressure dropped. 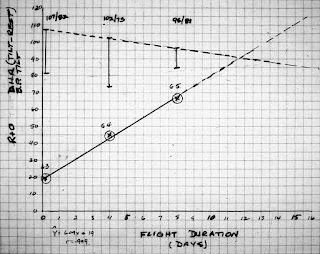 When we added these results to those from Gemini 3 and 4, we were concerned to see the astronauts’ orthostatic heart rates increasing and blood pressures decreasing as flights got longer. When extrapolated out to 14 days in weightlessness, a hand drawn graph predicted tilt heart rate increases of more than 100 beats per minute above supine resting rates which averaged over 85 beats per minute. There was no way an astronaut could maintain that kind of heart rate during a tilt test, or, by extension, any other orthostatic stress, perhaps not even sitting upright for a long period in the floating capsule. Earth-based studies suggested that orthostatic intolerance resulted from an actual decrease in measured blood volume. This was borne out by tests on the Gemini 4 and Gemini 5 astronauts. We measured reductions in both their volume of plasma (the liquid part of blood) and their number of red blood cells. Based on our measurements of the astronauts’ calf circumference, we also determined that increased pooling of blood in the legs was at least part of the reason for the Gemini 5 results. Gemini 7, which was scheduled to last 14 days in December, was my major concern. Although the Gemini 5 astronauts had returned to normal within 2 to 3 days, I was most concerned about the data from their first few minutes and hours back on earth, especially because previous Gemini spacecraft had landed a considerable distance from the carrier; Gemini 5 had been about 90 nautical miles away—about an hour by helicopter. As the physician member of the team that was going to have to rescue this crew if they should be incapacitated, I was incredibly concerned how we were going to get them out of the spacecraft, into the helicopter, back to the carrier and into sick bay. I had a vision of me, a newly qualified flight surgeon, with three frogmen and two unconscious astronauts an hour away from the aircraft carrier and additional medical help. So I did a lot of practicing with the UDT, trying to work out the best method of getting the crew out of the spacecraft and onto the life raft, and also work out some way to do cardiopulmonary resuscitation on a pliable raft in 6-foot seas. I also told the Gemini 7 commander, Frank Borman, “When you land, don’t just sit there and let the blood pool in your legs. You’ve got to keep your feet moving, keep your legs moving, and keep your blood pumping upward until we can get you out of there.” In a later television interview, Borman commented, with some astonishment, that some people were afraid the crew was going to faint. I was certainly one of them. Although neither astronaut fainted during the recovery, one did faint during a tilt table test about an hour after splashdown, but the other, tested about two hours after recovery, did not. In fact, his tilt test showed him to have a lower heart rate than either one of the pilots who were in space for only eight days. I was greatly relieved because this finding demonstrated that orthostatic intolerance didn’t inevitably continue to get worse over time—in fact, it appeared to level off as the missions got longer, and was also very variable among individual astronauts. With this new data, we concluded 1965 with confidence that astronauts could complete the longest planned Apollo mission. The Gemini data showed that the decreased blood volume was highly related to weight loss as was the increased heart rate and decreased pulse pressure. There was considerable weight loss variability among crewmembers, and factors other than duration of weightlessness must be considered. This would include caloric intake versus energy expended. It would also include fluid and electrolyte intake versus fluid and electrolytes lost in the urine plus sweating as well as insensible loss which may vary secondary to the dryness and warmth of the environment, especially while suited. The Gemini 7 astronauts were the only ones who were issued light-weight spacesuits that could be doffed in-flight, a capability that greatly enhanced their comfort and that they recommended for future missions. I went out to the carrier for Gemini 5, 6 and 7 as an assistant recovery physician, and then as the lead for Gemini 9, before transitioning to Apollo medical operations and planning. At the end of the Gemini program, I believed that there was still much to learn and that further comprehensive quantitative biomedical measurements should be made on Apollo to gain a better understanding of the effects of spaceflight on human physiology prior to landing on the moon. As for the astronauts, they believed they could take anything that was thrown at them. And, almost always, it was true.